Contender Boats recently celebrated its 35th anniversary with the release the new 44ST. 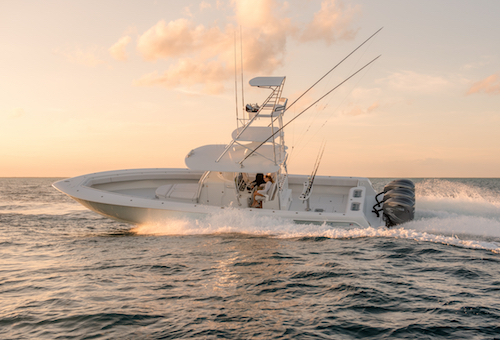 With a beam of over 12 feet, 600 gallons of fuel capacity and a 2000HP max HP rating, this 44 foot fishing machine is a game changer. The flagship boat made plenty of waves at the 2019 Miami Boat Show back in February, where it was officially revealed to the marine industry. The new 44ST embodies the Contender commitment to ’Performance Through Innovation’. Two 55 gallon transom livewells plus the availability of additional well space below deck insures your bait will have plenty of room and comfort no matter how long the ride to the promise land may be. When you reach the promise land, with 340 gallons of insulated fish box forward and 110 gallons insulated aft fish boxes, there will be plenty of room for your fish and all their friends. Available in triple or quad engine configuration, you really just have to decide how fast you want to get there. If speed is your thing, the 44ST will not disappoint. In initial testing, before motors were broken in, hull #2 saw 78.6 mph with quad 425HP Yamahas before it hit the rev limiter and hull #1 turned up an impressive 68 mph on a full load with triple 425HP Yamahas. For more details on the new 44ST contact your local Contender dealer or Click here to see the new 44ST online.